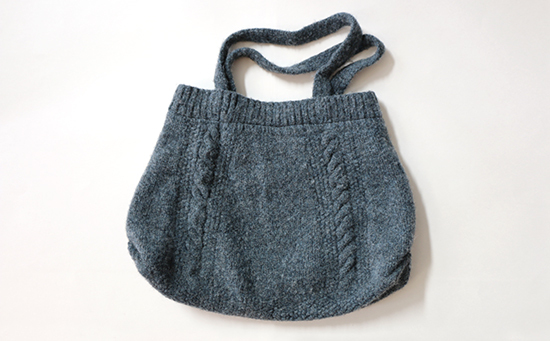 Last May, I blogged about a knit skirt that I had converted into a tote bag. I wanted to line the bag but needed to wait until after we moved and I had my sewing area set up again. This week, I pulled some quilting cotton from my stash and set to work making a lining for the bag. The fabric has a yellow background with a delicate blue-violet batik leaf print. The light background should make it easier for me to find items that fall to the bottom of the bag, and the print complements the denim blue of the bag exterior. The opening at the top of the tote bag is about 30 inches (76 cm) in circumference. The bag is about 14 inches (35.6 cm) tall, with a base that is about three inches (7.6 cm) deep. Between the depth from the base and sides that flare toward bottom, the circumference at the base is around 42 inches (106.7 cm). The shape of the lining needed to reflect the shape of the tote bag, so stitching together two simple rectangles wasn’t an option. Visualizing then mapping out the three-dimensional trapezoid/triangle combination took more time than I expected! I wanted to add some pockets to the lining for better organization. 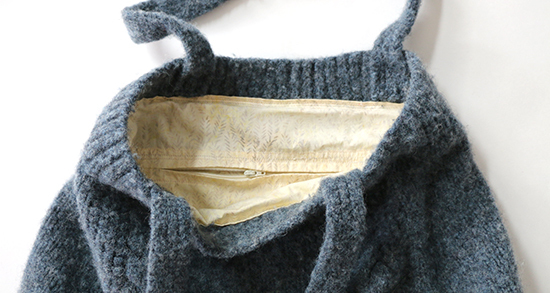 On one side, I sewed on an open pocket that is about seven inches (17.8 cm) square. On the other side, I inserted a seven-inch (17.8 cm) zipper over a pocket that is about six inches (15 cm) tall and eight inches (20 cm) wide. A new-to-me tool that I found very helpful was my hot ruler, which is a small heat-resistant ruler. (No affiliation.) I was able to fold the seam allowances for the zipper opening and pockets over the ruler, aligning the fabric edges with the correct measurements. After an initial press, I removed the ruler and pressed one more time to be sure that I had a crisp fold. Pressing those seam allowances down made it easy to sew them in place. Sewing the lining into the bag was a challenge. 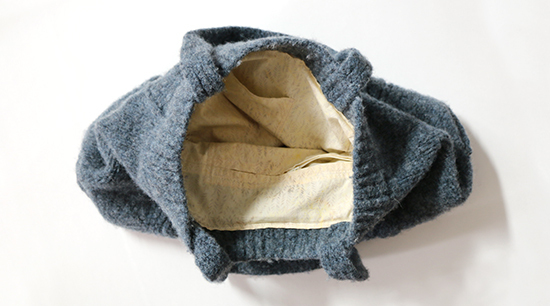 I wanted to attach the lining just below the top ribbing, but the felting made it difficult to tell exactly where that was as I was maneuvering the bag and lining under the sewing machine’s presser foot. In addition, the wool wanted to stretch and move whereas the woven cotton lining did not. In the end, close enough was good enough. The tote bag is too large for daily use. However, it will be excellent for those times when I want to carry a little extra in a bag that looks nicer than a standard canvas tote bag. I have a few occasions in mind already! Thanks for sharing your new Knit Tote! I've always wondered how to (neatly) accomplish a fabric lining. I think like anything else, it takes time and practice — and I'm not quite there yet! While the lining itself turned out well, I'm still trying to decide whether to undo how I machine-stitched it into the bag and redo it, possibly by hand.